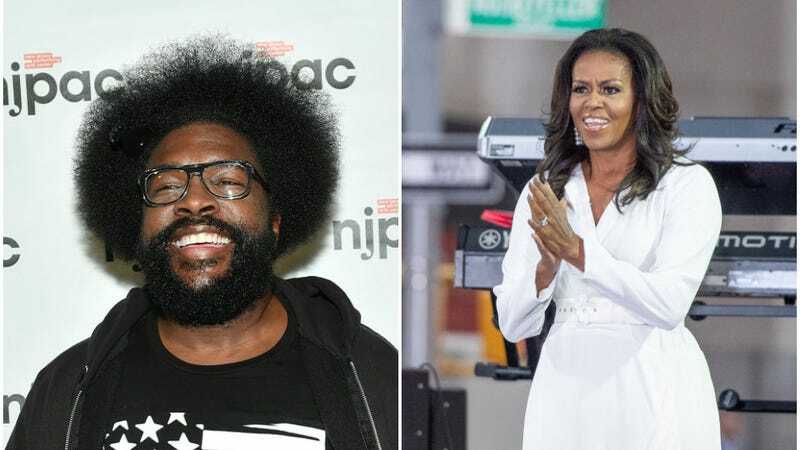 Good news for anyone who’s ever wanted to feel like a First Lady traveling the country on a book tour: The Roots and The Tonight Show drummer Questlove has just shared the playlist he created for Michelle Obama to listen to while promoting her memoir, Becoming. The Michelle Obama Musiaqualogy, aside from having a very good name, is impressively thorough, including 300 tracks that represent more than half a century of music history. The lists were created to warm up audiences and, presumably, Obama herself before speaking engagements, but they work just as well as an impressively curated selection of fantastic songs to enjoy over the next bazillion hours. All three volumes are available at both Spotify and Pandora and come highly recommended, both as an important ingredient in constructing your Michelle Obama-giving-a-book-reading cosplay project and as something to blast on your headphones this weekend while your family argues about turkey preparation methods.